These Caterpillars live and pupate in a silken case. Initially the case has sparse bits of debris attached to it. 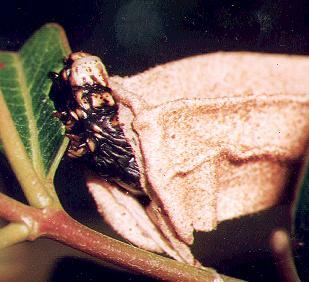 Later it develops several longitudinal ribs, and becomes quite bare, unlike many other species in PSYCHIDAE which cover their case in pieces of vegetation. 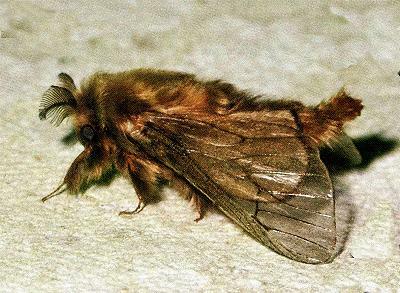 (Photo: courtesy of Bruce Anstee, Riverstone, New South Wales) The caterpillars normally only protrude the head and thorax, which have a hard orange and dark blue skin, from their case. 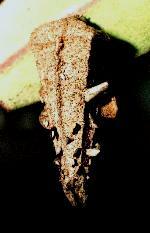 The abdomen is greyish and soft, so they normally keep that inside the protective case. The case can grow to a length of up to 4 cms. 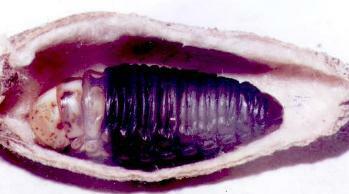 When metamorphosis is complete, the male extrudes the pupa from the posterior end of the case in order to emerge. 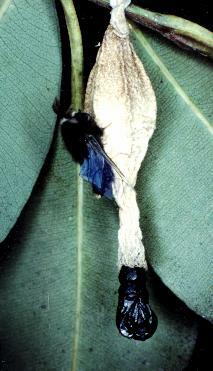 The male is has a hairy black head and body, with a fringe of white hairs around the head and a tuft of yellow hairs on the tip of the abdomen. 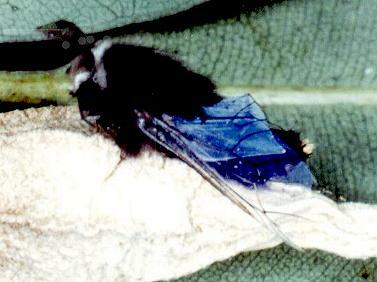 The forewings are transparent and the hindwings are variously blue, black or brown. 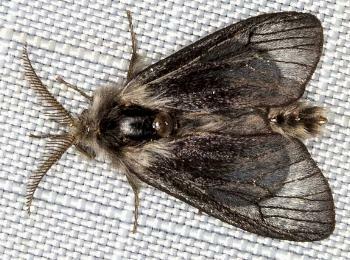 The wingspan is about 2.5 cms. 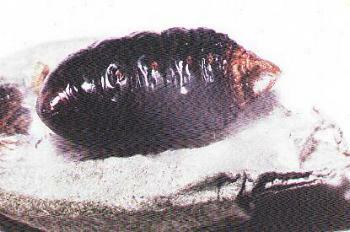 The female is wingless, with a tiny head and thorax. She stays within her case for fertilisation, and lays her eggs within the case. 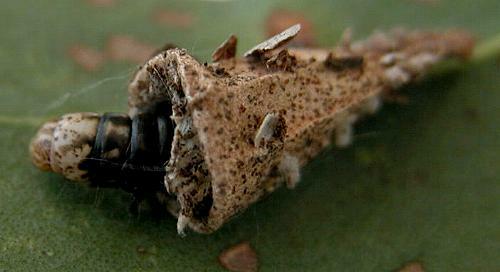 When the eggs hatch, the small caterpillars move to the outside of the case and onto the food plant. Though only about 3mm long, these small Caterpillars each have a small conical case, which they hold perpendicular to the surface they are on. Melbourne University Press, 1990, p. 180. London : T. & W. Boone Vol. 1 (1845), p. 437, Plate 5, fig.1. CSIRO Publishing, 2007, p. 48.